Onsen is the Japanese word for hot spring. Japan ranks among the countries with the most hot springs in the world, and you can find them almost everywhere you go in Japan. Quite often they are developed centers of relaxation with beautiful mountain or ocean views and edged with traditional Japanese Gardens. Depending on the location of the springs, they will flow with different colored water: clear, brown, yellow, green, milky white, and even red. The different mineral deposits found in that particular region of Japan cause the unique colors and smells. 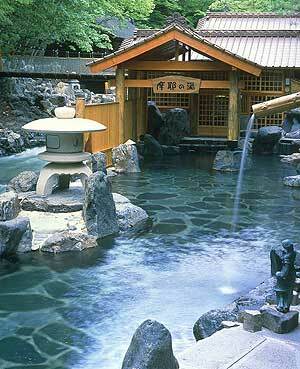 Each region is well known for the properties of their onsen water, and the health benefits that they purport to have. At drug stores and even dollar store across Japan you can find packages of bath powder that claim to be condensed minerals from that specific area, unfortunately they usually contain copious amounts of dye and scent. Look at this packet of powder from my personal collection. 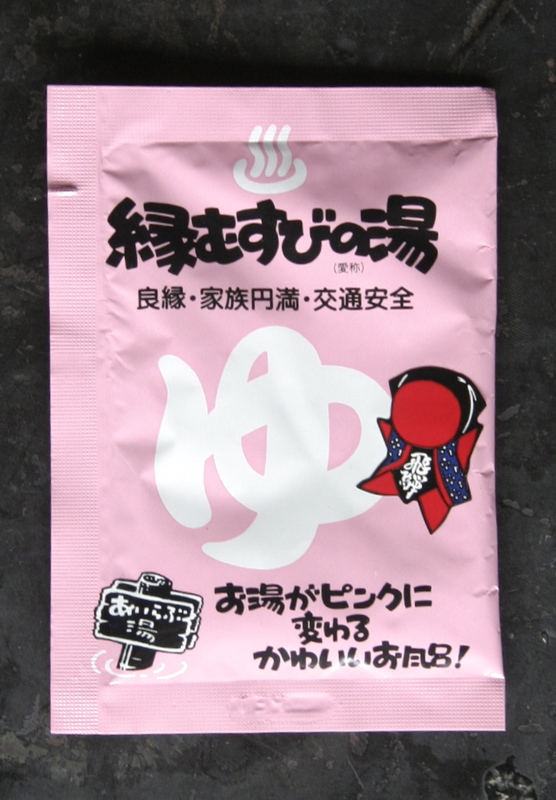 It is powder from the Hida area. The white symbol at the top is the symbol for onsen, and the big white character in the middle means yu, or water. Both of these are popular indicators of an onsen. Any hot spring that you go to anywhere in the world will have it’s own mythology and fact about the magical and medicinal properties of its waters. This is certainly true in Japan. At onsens frequented by tourists you can often get a pamphlet on the medicinal value of the water. Developed onsens will get very creative with the types of services and indulgences. All of them will have a change room a shower and one pool. Many have far more. For example: various pools at different temperatures and depths, individual soaker tubs, electric tubs (tubs with a weak, but shocking electric current that runs through the water and the only one you wouldn’t catch me in), outdoor tubs, waterfalls, jets, infused baths (eg: lavender, cedar, green tea, floating tangerines), steam rooms, steam rooms with mineral salt scrubs, cedar steam boxes (you body gets steamed but your head does not; they look like medieval instruments of torture but are actually quite nice), saunas, warm rooms, mud baths, cold plunges… and this list is by no means exhaustive. All these are included in the entrance fee if they are available. However, for a bit extra you can often pay for a massage. You will often see children at the onsen. Babies are allowed to come into the bathing area but must sit on the side so they don’t overheat or contaminate the water with feces. Children and babies are are nearly always taken into the women’s side but can go into the men’s as well. The cut off age for mixing genders is usually about eight or nine years old. 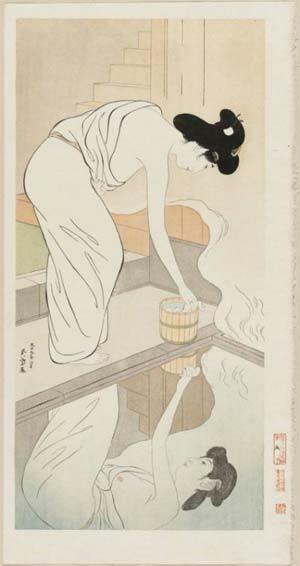 The gender segregation of bathing was only considered when Japan was open to the west and, it is said, the split was enforced to improve the world’s opinion of the country. For most wild onsens bathing is not separated and in some developed ones also, but both types can be hard to find. Families and couples can occasionally procure private bathing facilities, and some onsen hotels will have private onsens attached to individual rooms. The onsen is scared to the Japanese people, and as with most customs in Japan, there are traditions and rules that must be observed. Generally, if you remember and follow these three rules you will be safe. Here is a website written by a Japanese native, who wants to help foreigners (gaijin) enjoy the onsen, properly. Anime Onsen: These naughty characters are breaking every onsen rule in the book. Look at the small cluster of characters in the bottom left corner for a good example of how to behave. I lived a short10 minute walk from a very nice onsen in Takayama that was attached to a hotel. The fee for non-guests to enter was 1000yen, or about $10 and included a “decency towel.” The $6-12 dollar range is average, but I found many throughout the country that were free. I did pay $28 once in Tokyo to enter an Onsen Theme Park and another time I paid $32 for a soak and lunch at the attached gourmet French restaurant. I have just strated. Have a nice day. I live in Vancouver, Canada but I was an ESL teacher in Takayama (Gifu) for almost two years. I love going to the Onsen, but Canada does not have a single onsen. There are a few hot springs, but they are either all natural or they get chlorinated and put into big swimming pools, yuck! I have started researching different cultural traditions surrounding bathing. It is a fun hobby. Hey I have a question. About what you wrote to me was “Good pronunciation”. What does it mean? Pronunciation means how I speak with good sounds right? sorry my English isn’t good. Teach me. I spent 2 weeks in Kyushu visiting family, we visited about 8 different onsen over the 2 weeks. I became addicted. 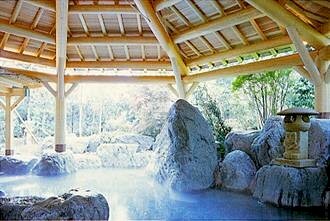 What is the closest you’ve been able to find to an onsen experience in/around Vancouver. I still can’t understand why there is no onsen style bath house in the GVRD, I can’t wrap my head around it. Hi Jason, There is nothing like bathing Japan! I really enjoyed Lussier as well and have been avoiding Maquinna for the same reason you disliked it. However, I do hope to get out there someday. If you find any gems I would love to hear about them. I also lived in Japan and love 温泉! I’ve been looking for something similar ever since I moved back to Canada – this blog is really nice. Have you tried the outdoor ocean-view rock pool in Hot Springs Island, BC ? ?